How do I mark a module item as done for a module requirement? 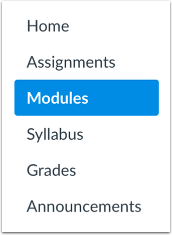 Your instructor may require you to mark a module page or assignment as completed before you can progress to the next item in the module. Marking a content page as done means that you understand the course material in the content page and are ready to progress to the next item. Additionally, when you mark a content page as done, its associated to-do item is removed from the to-do list and the item displays as complete in the Dashboard List View. Note: You may be able to mark online or external tool submission assignments as done. However, you must still submit the assignment for your instructor to grade. Click the name of the content page with the requirement. Click the Mark as Done button. When you mark the page as done, the button changes from Mark as Done to Done. If you want to unmark the page as done, click the Done button. The button will turn back into the Mark as Done button. Previous Topic:How do I view Modules as a student? Next Topic:How do I choose an assignment path in a module? Table of Contents > Modules > How do I mark a module item as done for a module requirement?